Final destination for addictive drugs. The release of dopamine and serotonin in the nucleus accumbens lies at the root of active drug addiction. The pattern of neural firing that results from this surge of neurotransmitters is the “high.” It is the chemical essence of what it means to be addicted. 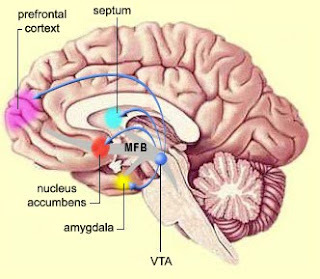 Part of the medial forebrain bundle (MFB), which mediates punishment and reward, the nucleus accumbens is the ultimate target for the dopamine released by the ingestion of cocaine, for example. The release of dopamine and serotonin in the nucleus accumbens appears to be the final destination of the reward pathway—the last act in the pleasure play. If you think about a drug, take a drug, or crave a drug, you are lighting up the nucleus accumbens with a surge of electrochemical activity. These are essentially the same pathways that regulate our food and water-seeking behavior. 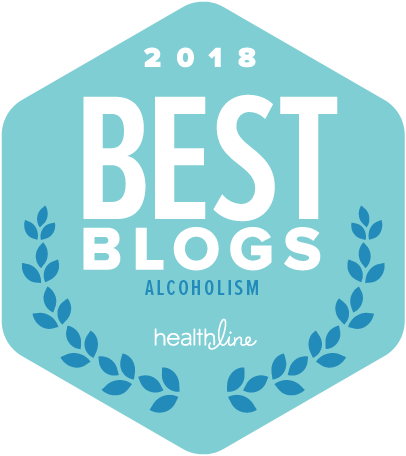 By directly or indirectly influencing the molecules of pleasure, drugs and alcohol trigger key neurochemical events that are central to our feelings of both reward and disappointment. In this sense, the reward pathway is a route to both pleasure and pain. Alcohol, heroin, cigarettes, and other drugs caused a surge of dopamine production, which is then released onto the nucleus accumbens. The result: Pleasure. When scientists pipe a dopamine-mimicking substance into the nucleus accumbens, targeting dopamine D2 receptors, withdrawal symptoms are blocked in morphine-addicted rats. Similarly, when scientists block dopamine receptors in the accumbens, the morphine-dependent rats exhibit withdrawal symptoms. When you knock out large slices of the nucleus accumbens, animals no longer want the drugs. So, one cure for addiction has been discovered already—but surgically removing chunks of the midbrain just won’t do, of course. Dopamine is more than a primary pleasure chemical—a “happy hormone,” as it has been called. Dopamine is also the key molecule involved in the memory of pleasurable acts. Dopamine is part of the reason why we remember how much we liked getting high yesterday. The nucleus accumbens (also known as the ventral striatum) seems to be involved in modulating the emotional strength of the signals originating in the hippocampus. This implicates the hippocampus in relapse, even though this area of the brain does not light up as strongly during actual episodes of craving. The fact that we know all this is nothing short of amazing, but it is part of a larger perspective afforded by the insights of contemporary neurobiology. We know, for example, that the emotion of fear arises, in large part, through chemical changes in a peanut-sized limbic organ called the amygdala. Does this information make fear any less, shall we say, fearful? It merely locates the substrate upon which the sensation of fear is built. Studies of the nucleus accumbens have demonstrated abnormal firing rates in scanned addicts who were deep into an episode of craving. The craving for a reward denied causes dopamine levels in the nucleus accumbens to crash dramatically, as they do when users go off drugs. Dopamine, serotonin, and norepinephrine activity soars just as dramatically when a drug user relieves withdrawal symptoms by relapsing. Drug hunger in abstinent addicts is not all in the head, or strictly psychological. Craving has a biological basis. Finding a way to override serotonin- and dopamine-mediated mid-brain commands is the essential key to recovery from addiction. One of the aims of a biological understanding of addiction is to tease out the mechanisms by which the reinforcing effects of addictive drugs become transformed into long-term adaptive changes in the brain. Adapted from The Chemical Carousel: What Science Tells Us About Beating Addiction by Dirk Hanson © 2008. To Anonymous: Oh nothing, except it takes away the point of life:enjoying stuff. Their understanding is not accurate. I am a heavy Cannabis user, and I still experience non-drug induced, pleasurable altered states even during drug craving episodes. I do not see how a larger nucleus accumbens reduces pleasure responses (proposed effect of Cannabis use). Maybe it is because I do not use Cannabis as a reward but usually a modulator? That is not to say that many normal pleasures are not pleasurable to me, but that was the case way before I ever used drugs. The same goes for my ADHD like nature.